Prog 883 was published in April 1994 and it's what's called a three-Millar prog. That's not a good sign. Judge Dredd is again written by Alan McKenzie under his "Sonny Steelgrave" pseudonym, the last of a three-parter illustrated by Mick Austin. It feels a little awkward, but it's honestly not bad. The Clown is continuing its second run, scripted by Igor Goldkind and painted with mud by Robert Bliss. This is one of those stories where the supporting cast is a million times more interesting than the star; they could have done a series about these cheesecake-obsessed cops which might have been pretty good. Then there's a story with apalling art by Jim McCarthy and a story with quite good art by Anthony Williams and a story with very, very good art by Simon Jacob. And some really horrible scripts. If you ever get the notion I might be beating a dead horse by coming back again and again to the spectacular awfulness of Mark Millar, well, you might be right, but he brought it on himself, not merely by writing some dreadful scripts, but writing so many of them. And then they all got commissioned! But the difference between Millar and Ennis couldn't be more blatant. Ennis speaks with humility about his earliest series for Crisis and with regret that he didn't do a better job on his 2000 AD stories, despite the many very good scripts he contributed at the time. Millar, however, has been nothing short of dismissive, speaking with punkish contempt about the 2000 AD veterans who came before him, and making no secret of the fact that he wanted to use 2000 AD as a stepping stone to work for American comics. Nowhere is this more evident than in Millar's godawful take on Judge Dredd, which might have been truly called Super Dredd and the Keystone Kops. A Mega-City One judge, in Millar's hands, wouldn't last three minutes with a declawed kitten, unless the judge is Super Dredd, who can beat up anybody on account of him being Dredd, and him being the toughest one there is. 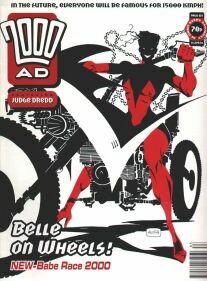 This is a particularly rough period for the comic, with one six-part storyline after another featuring either an indestructible (apart from the hand) priest (Canon Fodder) or an indestructible guy with bad teeth (The Grudge-Father) or an indestructible motorcycle mama (Babe Race 2000) or an indestructible Soviet super-judge (Frankenstein Division) or the other indestructible Soviet super-judge (Red Razors), all yelling and battering their ill-defined opponents. No wonder we loved the thoughtful and charming Luke Kirby - about which more next week - so much at the time. It's a very short hop from these incredibly stupid strips to Millar's Ultimate Captain America shouting "Do you think this A stands for France?" in Marvel Comics. And if you think that passes for clever, then you might enjoy Millar's 2000 AD work just fine. I like that. Despite the fact that the robot baddie's dialogue is a pretty good example of the tough-guy yelling that's Millar all over, and despite the fact that Millar's general take on Robo-Hunter - turning a down-on-his-luck, can't-get-a-break loser into an ultraviolent, minor celebrity with his own line of scrapbook annuals for his fan club - is the most wrongheaded botchjob seen in the medium, that's a pretty clever little cliffhanger. Tharg was in the process of transitioning Robo-Hunter from Millar to Peter Hogan when this was published, although it didn't really take and the whole period, despite Hogan's charming efforts, has since been excised from the Sam Slade canon. There were two Hogan stories prior to this, which sensibly returned Hoagy and Stogie to the lineup; they'd been mostly absent for Millar's run. "The Robotic Revenge of Dr. Robotski" was Millar's last Robo-Hunter adventure, and it's the best of his ten tales, by miles. It's still lousy, penned by a writer indifferent to anything beyond his page rate, and enlivened only by Simon Jacob's great art, full of dramatic angles and inventive use of color. But that cliffhanger's actually pretty good. It prompted a smile, and it suggests that Millar could have been using the format for stories that were inventive rather than repetitive. I haven't followed his post-2000 AD career very closely. I know he cowrote some stuff with Grant Morrison that was occasionally good (Aztek: The Ultimate Man, nine months on The Flash, six months on Vampirella, four months on Swamp Thing), but, left to his own devices... well, there was that fill-in on JLA with Amazo which was godawful, and that three-month "The Black Flash" story wherein the Flash defeats a foe who cannot be outrun by, errr, outrunning him. Next week, praising something underrated. 9. Judge Dredd... in the Flesh!